There is something so pleasing about the combination of earthy black beans and roasted sweet potatoes. Feel free to experiment with the recipe, turning the toppings into taco fillings or substituting goat cheese for the Monterey Jack. On a large baking sheet, pour enough oil to create a thin film. Place the sweet-potato cubes on the pan, cover with a big pinch of salt, toss to coat with the oil, then spread out in a single layer. Roast the sweet potatoes in the preheated oven for 15 to 20 minutes, stirring after 10 minutes, until cooked through and light brown. Set aside the cooked potatoes and lower the oven temperature to 350 degrees. Meanwhile, add enough oil to coat the bottom of a medium saucepan. Sauté the onion until soft and starting to brown. Add the black beans along with some of the cooking liquid (if using canned beans, drain and rinse them first) or water, about a half-cup. Add the cumin and salt to taste. Bring to a boil, then simmer while you prepare the rest of the ingredients. Just before spreading the tostada shells, roughly smash the beans with a potato masher (this will keep them from rolling off the tortillas). To prepare the tostadas, place tostada shells on one or two large baking sheets. 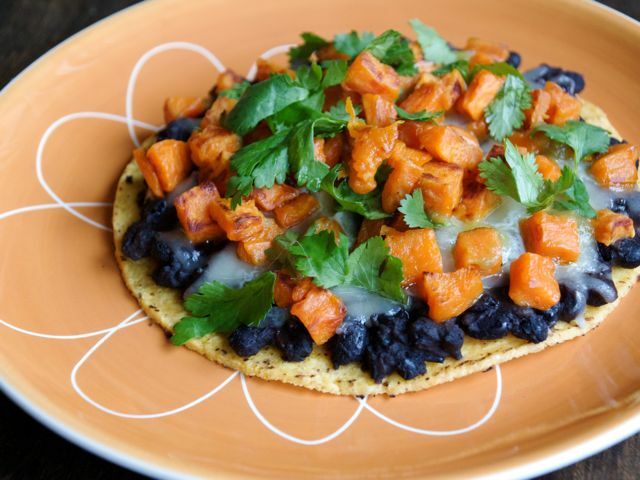 Divide beans among the 8 tortillas, then top with the grated cheese and the roasted sweet potatoes. Bake for about 10 minutes, until the cheese is melted and everything is hot. Just before eating, top each tostada with cilantro, salsa or hot sauce, and a squeeze of lime.